If you enjoy the sweet, lemon-flavored Italian liqueur limoncello, you should consider purchasing a set of ceramic limoncello shot glasses. However, you may already own perfectly acceptable shot glasses you can use to serve it. There is no need to worry that they are not appropriate. Limoncello is meant to be sipped following a satisfying meal. It is served in small quantities due to its high alcohol content. It can be presented to you in a variety of different glass types depending on the restaurant or bar at which you are a patron. You can also use any of the following glasses to serve it to guests in your home or at a party. If you have a set of typical shot glasses in your cabinet, they are a perfectly acceptable vessel in which to serve limoncello to your guests. Both short shot and taller shooter glasses are acceptable. Either holds about the same amount of alcohol. 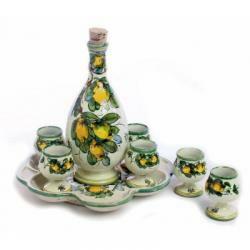 Limoncello originated on the Amalfi Coast in Southern Italy, an area known for its ceramics. It was traditionally served in small ceramic shot glasses, and they are still available for purchase. Caravella, a brand that makes limoncello, produces a set of yellow ceramic shot glasses that feature its logo. You can find them at many liquor and package stores, and you can also find them on some auction sites. Many after dinner liqueurs are served in elegant stemmed cordial glasses. They contain about the same volume of liquid as a typical shot glass, but they feature a short stem that makes them easier to hold for sipping and also helps keep the limoncello cool. The only downside is that they are more prone to breakage than your average shot glass. Some limoncello shot glasses are available in a variety of color options. However, keep in mind that the intense yellow of the limoncello is quite beautiful, and a clear glass shows it off well. No matter which type of glasses you choose, store them in the freezer before you pour to keep the liqueur icy cold and refreshing. Not only should you store your glasses in the freezer, store the limoncello bottle as well to keep the liquid cold. It won't freeze due to its high alcohol content. Buy a decorative set of limoncello shot glasses while on a trip to Italy for a great souvenir or a gift for your favorite limoncello sipper back home. In a pinch, serve limoncello in white wine glasses. Just be sure to only serve a shot glass worth of liqueur. Limoncello is strong. Check stores like Williams Sonoma for mass-produced versions of specialty limoncello glasses. Keep in mind that wider glasses will keep the limoncello cool longer while tall and narrow glasses may cause it to warm up a little quicker due to the higher potential for surface contact with the glass. 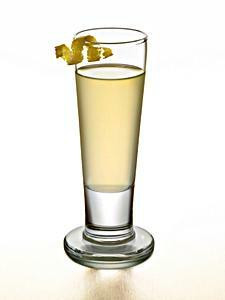 However, limoncello never lasts too long, so ultimately it doesn't make that much of a difference which glass you use. The limoncello is the real star of the presentation.